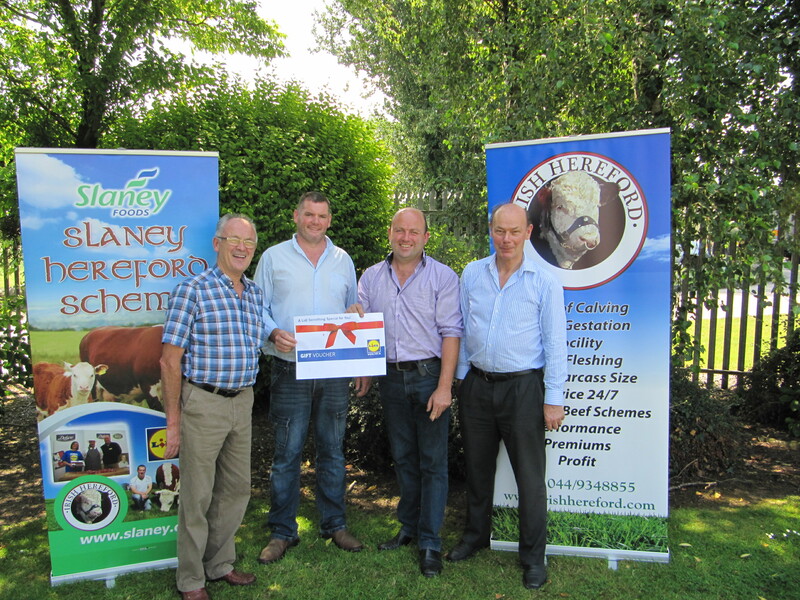 Slaney Foods International, Bunclody, Co Wexford was the venue for the presentation of prizes to the winners of its competition to forecast the Carcase Grade of a Quality Assured Hereford Steer which was on display at the National Ploughing Championships. The competition was part of a very successful promotion at the Irish Hereford Breed Society’s stand at the event. Competition entrants were vying to win one of three prizes of Lidl vouchers, each to the value of €500 sponsored by Lidl Ireland, Slaney Foods International and the Irish Hereford Breed Society. The vouchers may be redeemed at any of the 140 Lidl stores across Ireland which provide a wide range of goods at excellent value for money including the quality range of ‘Inisvale Selection’ Certified Hereford Irish Beef matured for 28 days for extra tenderness and flavour. The 3 Lucky winners were Andy Mulhare, Ballybrittas, Portlaoise, Noel Quinlan, Gowran, Co Kilkenny and Nick Redmond, Gorey, Co Wexford. The awards were made following a reception at the headquarters of Slaney Foods International with representatives of the Sponsors on hand to congratulate the winners. A huge thank you is extended to all who participated in the competition, to the winners and to Quality Assured producer Henry Parr, Clogh, Castlecomer who provided the Hereford Cross steer for the competition to John Canty, Kildalkey who provided two excellent 24 month old 600kg heifers, a selection of high merit suckler dams with their calves and five star sire and finally to Nigel Heatrick, Glaslough, Co Monaghan who exhibited his prizewinning and 5 star stock bull a great source of interest throughout the event. Nicholas O’Connor left and James O’Connor 2nd from right receive their prize of a €400 LIDLshopping voucher from John McDonnell Slaney Foods, and Larry Feeney Irish Hereford Breed Society Ltd.
Over the past three months the Irish Hereford Breed Society has in association with partners Slaney Foods run a major competition to attract additional suppliers and cattle to its certified Irish Hereford Beef program. The project has been extremely successful in its object of attracting top class beef farmers and quality assured Hereford sired steers and heifers for the fast growing “Irish Hereford Beef” range at major supermarket chain LIDL. The latest and final winner in the current competition is Wexford man Nicholas O’Connor of Spring Farm Drumgoold. Nicholas who farms with son James runs a substantial autumn calving dairy herd of 175 cows. Approximately 40% are mated to Friesian/Holstein bulls for replacements with the remainder to Hereford. Some Hereford sired calves are sold off at about eight weeks with the heifer calves more often than not making similar or better prices than the bull calves according to James. The remainder are retained for finishing on farm and taken through to slaughter. Unusually for nowadays no camera is used to supervise calving since calving does not provide any major difficulties. Ease of calving is a given with the majority of the herds cows calving down without assistance of any kind. If one is due to calve at bedtime one might wait on for completion of the event otherwise its early to bed etc. All winners of the competition to date had the choice of a €500 Hereford bull purchase voucher or a €400 LIDL shopping voucher. Without exception all winners have chosen to experience “a Lidl bit of Magic” selecting the €400 LIDL voucher as their prize. Shoppers at the fast growing chain have the opportunity to purchase top quality products including Irish Hereford Beef. Take the opportunity to visit a store near you and purchase one of the many cuts of Irish Hereford Beef available including the new mini Irish Hereford Burgers just added to the range which are scrumptious. The last thing Lorraine Connolly, Ballylarkin, Freshford expected on her birthday was a call from Slaney Foods, Wexford to tell her she was the winner of their April Slaney/ Hereford/ LIDL competition. Offered the choice of a 500 Euro Hereford bull purchase voucher or a 400 Euro LIDL shopping voucher she quickly choose the LIDL voucher. 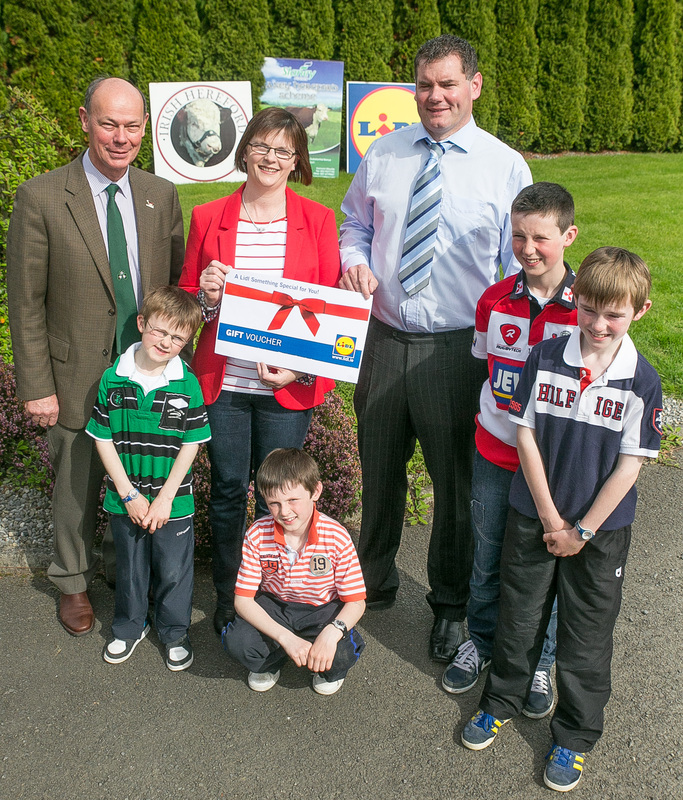 With four fast growing sons plus husband Paudie to cater for Lorraine had no hesitation in her selection. “Whether shopping at LIDL or keeping Herefords your money goes further” stated the obviously delighted winner. A chef by profession in addition to her farming enterprise Lorraine is very conscious of quality food and in particular quality beef. Quality Hereford sired calves are purchased each year usually at Thurles Co-op mart and taken to slaughter at two years or less. Quality grass and silage are an integral part of the diet. Sons Padraig (who has just had a trial for the under 14’s), Connor, Mark and Cian all aspiring Kilkenny county hurlers who are also keen John Deere fans were looking forward to silage making on May 16th which is two weeks earlier than in 2013 and looks a bumper crop. 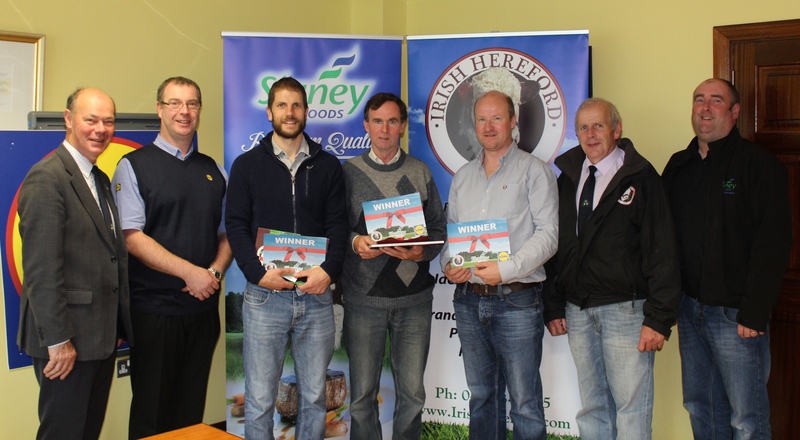 The competition is part of a campaign to attract additional suppliers of quality assured Hereford sired steers and heifers for the very successful Slaney/Hereford beef program at Slaney Foods and continues throughout May and June. Delighted with “a LIDL bit of magic” on her birthday Lorraine is looking forward to her shopping spree at LIDL which she says will definitely include the purchase of a supply of “Deluxe” Irish Hereford Beef which has been a top seller since its launch as part of the LIDL “Deluxe” range. 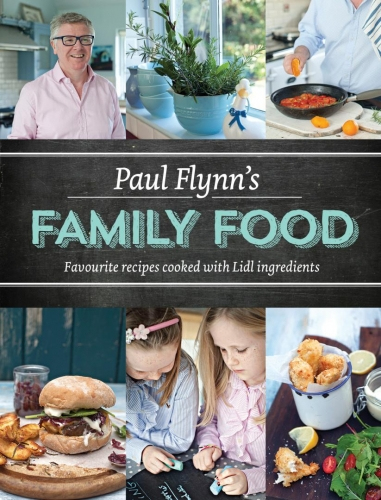 Fancy a chance to win Paul Flynn’s ‘Family Food’ cook book? Fancy a chance of winning Paul Flynn’s ‘Family Food’ cook book? Paul Flynn has teamed up with LIDL Ireland to provide you with some of the most delicious home cooked meals using ingredients from LIDL and there are many succulent ‘Deluxe’ Irish Hereford Beef dishes in there for you to try out! We have a FREE ‘Family Food’ cook book to give away! All you have to do is follow the link below and enter your details, it’s that simple. No catch!